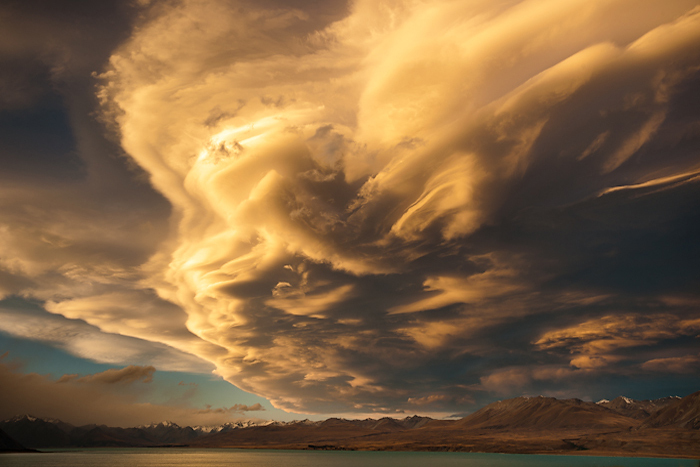 On my way… and traveling home from Lake Wanaka to Lake Tekapo the sky to the west was showing signs of dramatic evening light. A quick detour around Mount John to higher ground and I had reached a tussock clad hill to watch the show unfold. The colours and shifting cloud formations were breathtaking. I was constantly twisting, turning and looking up, searching for compositions that would appear and disappear in a heartbeat. The sound of the wild westerly wind only added to the drama, almost rendering a tripod useless. The evening left me in awe of the landscape. TIP: Don’t leave any expensive camera gear by a tussock unmarked… especially in fading light! In my rush to change lenses and trying to capture everything before me I put the spare lens on the ground unmarked…duh! When the show was over I realised I had about 15 minutes of light left to find a NZ$3,000 lens in a mass of countless tussock. Calm prevailed as I took some known bearings… but it was close, you’d think I had lost a child the way I hugged that lens when I found it!